The smartphone ecosystem is filled with tons of brands that keeping track of them all can become overwhelming. However, there are some “top dogs” in the industry whose names are top-of-the-mind as they have rightfully earned their spot at the top. Nokia is one of such brands, and even though the Finnish company once went off the radar about a year ago when it was knocked off by existing and emerging brands with killer devices, Nokia is back and this time, with a bang! But ever since its return to the scenes, there seem to have been so many unanswered questions about the brand. We answer some of them below. Since Nokia has been in the business of making phones (and now smartphones), its ownership has been tossed around a great of time. From Nokia to Microsoft, HMD Global etc., Nokia Mobile’s ownership has switched hands a couple of times in the last decades. That being said, the Finnish giant is presently owned by HMD Global, a company created by ex-Nokia executives. This same HMD Global solely owns the right to manufacture and market Nokia-branded smartphones and tablets. The acquisition of Nokia (the phone business) by HMD Global was finalized on May 2016 from Microsoft Mobile when it sold the Nokia business to the former exactly 2 years after acquiring the business in April 2014. 2. Are all Nokia Phones Android? Technically, no. But logically, yes. About the former, not all Nokia-branded smartphones out there run the Android operating system. There are still Nokia Lumia smartphones that are based on Microsoft Windows Phone OS. In fact, some still actively run the Symbian operating system (though the OS has been discontinued). However, Nokia had jumped on the Android OS bandwagon with its X line of smartphones even before Microsoft completed its acquisition and made Windows the primary OS for Nokia ‘Lumia’ devices. The first family of Nokia smartphones to run the Android OS are the Nokia X, X+, and XL. To the ‘Yes’ part of the answer, all Nokia flagship smartphones being released after the company’s acquisition by HMD Global are all Android-powered. 3. Are Lumia Phones still being sold? Straight answer — No. As soon as Microsoft sold ownership rights of Nokia phones to HMD Global, the Lumia family of smartphones died with it. While existing users will continue to get bug fixes, security updates, support and other information (till God knows when), there will be no production of new Lumia phones, neither will the company be rolling out new features and apps to old, existing devices. 4. Are Lumia Phones still covered under Warranty? If you bought a Nokia phone when the company was still being operated by Microsoft, your phone is still very much covered under warranty as stipulated from the moment of purchase. 5. Which country(ies) manufacture Nokia phones? Before I proceed, I should state now that when Microsoft sold Nokia, a part of the business was acquired by HMD Global while another was acquired by Foxconn, a multinational electronics manufacturing company based in Taiwan. Nokia phones are manufactured almost everywhere a phone can be manufactured. Some are made by HMD Global in Finland, some in Taiwan by Foxconn while a good number are also outsourced to companies in China, Hungary, Vietnam, Brazil, Germany, etc. 6. Is there a Waterproof Nokia phone? You mostly hear this sort of question from Nokia loyalists who see their folks with water-resistant iPhones and Samsung at the pool. Luckily, ever since Nokia’s return to the Android smartphone pool, the OEM have made a couple of high-end flagships with waterproof capabilities. The Nokia 8 Sirocco comes with IP 67 waterproof certification while the IP 57 rating of the Nokia 8 only makes it resistant to splashes and not underwater usage. 7. How highly-priced are Nokia phones? Basically, like every other smartphones manufacturer, Nokia phones also come in top-tier, mid-range, and low-end models. And these categories are priced in accordance to the level of features they sport. 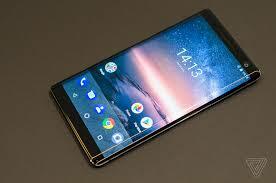 The Nokia 8 and Nokia 8 Sirocco, for example, are currently the most sophisticated phones from Nokia. Likewise, the most expensive. The Nokia 5.1 Plus, Nokia 6, Nokia 6.1 Plus, and Nokia 7.1 Plus belong to the mid-range class of the Finnish mobile company. 8. Which Nokia Phone is the best to buy? While this question is subjective to a couple of factors like budget and preference, the Nokia 8 Sirocco — spec-wise— is one arguably the best smartphone ever made by Nokia. The device is an upgrade to the Nokia 8 and it sports a finely finished glossy body with metal frame and Corning Gorilla Glass covering on the rear and front. There is a dual camera setup on the rear, a fingerprint sensor and it issue water and dust-resistant. It also supports Qi-standard wireless charging technology. 9. Which Nokia Phones supports Android 9 Pie? The Android 9 Pie is the latest iteration of Google’s operating system. While HMD Global had earlier announced that the Android 9 Pie will be coming as an over-the-air upgrade to the Nokia 3, 5, 6, and 8, the Pie update have rolled out to Nokia 6 and Nokia 6.1 last month. Nokia however promises a November roll-out date for the Nokia 8 and Nokia 8 Sirocco. 10. What’s up with the Nokia 9? The Nokia 9 HMD Global’s upcoming flagship phone expected to succeed the Nokia 8 and 8 Sirocco. For months, the device has been in the spotlight for many reasons. One, it is rumored that the Nokia 9 will come with a total of five cameras (Yes! 1, 2, 3, 4, 5!) on the rear. In fact, there are even image and video renders to support this rumour. About when the Nokia 9 will be released, no one can really confirm. Initially, the device was scheduled for a Q4 2018 release but was reported postponed till next year. However, there are reports that there’s a possibility of the Nokia 9 surfacing before 2018 comes to an end.